HOLLY CREEK is only a 10 minute drive from downtown HELEN GA. Located in the private subdivision of SWISS COLONY on the back side of the famous MT YONAH. This cabin is a beautiful, custom built cabin with all wood interior. It features a 6 person HOT TUB on the wrap around PORCH. It provides a unique atmosphere only a babbling creek can provide. This cabin offers a SPACIOUS living area with an all rock wood FIREPLACE. This cabin has FREE wifi, a Charcoal grill and all paved drive way up to the front door. It has two FLAT SCREEN TVs and a comfortable loft with it’s own bathroom and queen size bed. Feel like you’re at Grandma’s house in the rustic country kitchen and dining area. Sure to please, Holly Creek is the retreat you’ll want again and again. 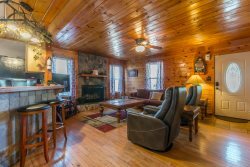 This cabin is perfect for those wanting easy access to HELEN GA and for those wanting easy access to their cabin in a beautiful and very PRIVATE setting. Minimum age of primary renter is 29. Recommend maximum of 6 adults with children and up to 8 guests maximum. Dist. from Helen: 7 min. Dist. from Office: 10 min. Dist. from Trout Pond: 10 min. Located in the heart of North Georgia; only 3 miles from the Alpine Village of Helen. We didnt see anyone while we were there but the cabin was very clean when we arrived and had all clean towels and everything we needed. It was a nice place to stay especially if you are staying longer than a weekend.